Minimalism , while held up as a 'purity' in design, also raises many criticisms. One could assume with such high standards, minimalism is in fact harder to be successful in than any other pre-derterminded style standard. A teacher of mine once said that the closer you get to perfection, the more things you find wrong. An example being making a sphere out of any material - if it's completely lopsided, it's easy to critique and move on, however, if it's almost completed, you're able to point out every imperfection in depth and presentation. Gridskipper points to a recent work in minimalism that begs for criticism. 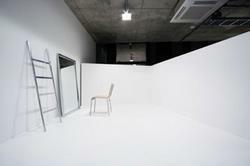 The LIM Hair Clinic in Tokyo consists of the "bleakest aesthetic horizon line", containing a chair, an unmounted mirror, and 4 walls of white paint. Wonder if they used eggshell or lamb's wool white?